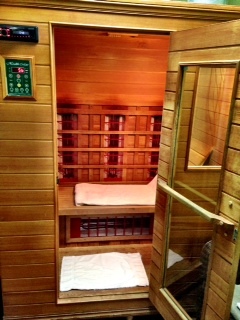 The far infrared sauna system for whole body radiant energy delivers the far infrared rays that penetrate deep into the body. The cleansing and purifying benefits of the traditional sweat lodges in American Indian and Scandinavian cultures have long been known, and saunas have been used for centuries for an overall feeling of well being. Infrared heat is simply a form of energy that heats the object directly, without having to heat the air in between. So, unlike traditional saunas, the infrared heaters used in the sauna directly heat the occupants without heating the surrounding air. This dry heat can induce 2-3 times the sweat volume of a traditional sauna while operating at lower, more comfortable temperatures, making it more comfortable to breathe. The skin is our largest organ and is responsible for eliminating up to 30% of body wastes. Toxins and waste in the body from alcohol, nicotine, chemicals, heavy metals and more may be released through the skin. 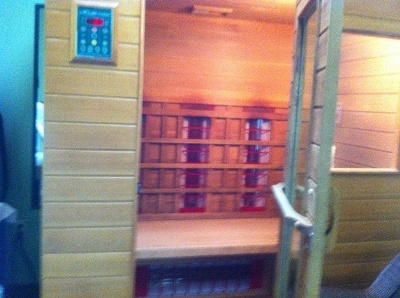 The deep infrared penetrating heat causes toxins to be released from the cells and exit the body through the sweat glands without burdening the liver and kidneys. The skin is like the kidney in that it filters the blood and aids in detoxification. In fact, the skin has even been called "the third kidney" for it's ability to eliminate waste. As the pores open the skin sheds dead cells leaving the skin glowing and clean. We are exposed to toxins daily in our fast paced, modern world. Personal care products, cell phones, microwaves, wireless electronics, processed foods, plastics, cleaning products, carpet, water, and food may contain chemicals or emit electromagnetic frequencies. So, how do we stay healthy? Our body is designed to eliminate toxins from the body as part of the natural processes in the liver, kidney, bowel and skin. But there are simple things we can do to help flush out the bad stuff. To maintain health, you need to a) Minimize the toxins you are exposed to, and b) Improve the ability to rid yourself of toxins in your system through detoxification.